SalesSeek makes it really simple to merge duplicate Individuals, Organizations and Deals. Do you sometimes come across duplicate records in your SalesSeek account? SalesSeek makes it really simple to merge these records without losing any data. When there are multiple records you'd like to merge select them all and click the merge button. SalesSeek will look at the records you've selected. If the two records are exactly the same the merge will be made. If there is conflicting information in the records you'll be prompted to choose which value is correct. In this example the owner, and the 'Pre-Payment' custom field values do not match. Once you've chosen which value is correct, click Merge. SalesSeek will merge the selected records. Question: How many records can be merged at once? Answer: You can merge 2 - 5 records at once. 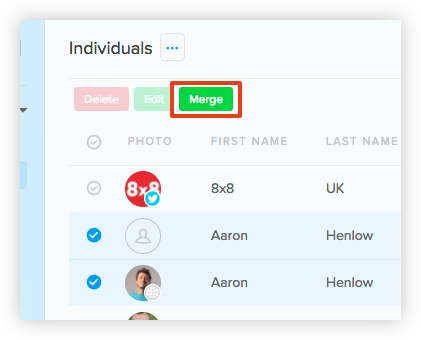 If you need to merge more than 5 records, first merge 5, then merge the remaining records to the recently merged record. Question: Can a merge be reversed? Answer: No, a merge is permanent and cannot be undone.